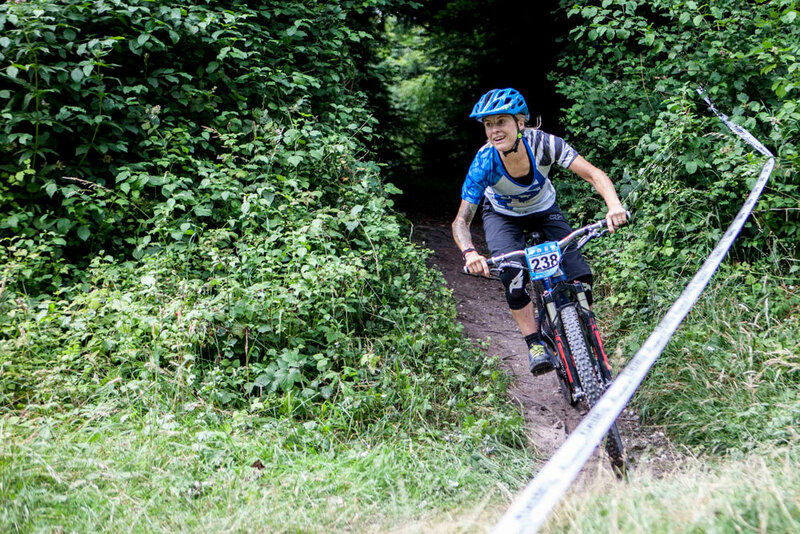 My most recent mountain bike race involved a trip to Hampshire to camp out and race Round 3 of the Southern Enduro series. I’m not 100% convinced that sleeping in a tent with my incredibly loud, snoring husband is the ideal start to a race so I turned up feeling a bit ropey, though that could have been the Doom Bar we were drinking the night before. I’d also done some Interval training AND been for a swim the previous day and with hindsight, perhaps doing both wasn’t wise. But whatever, I don’t think I ever turn up for a race thinking ‘I feel great!’ Not ever, ever! 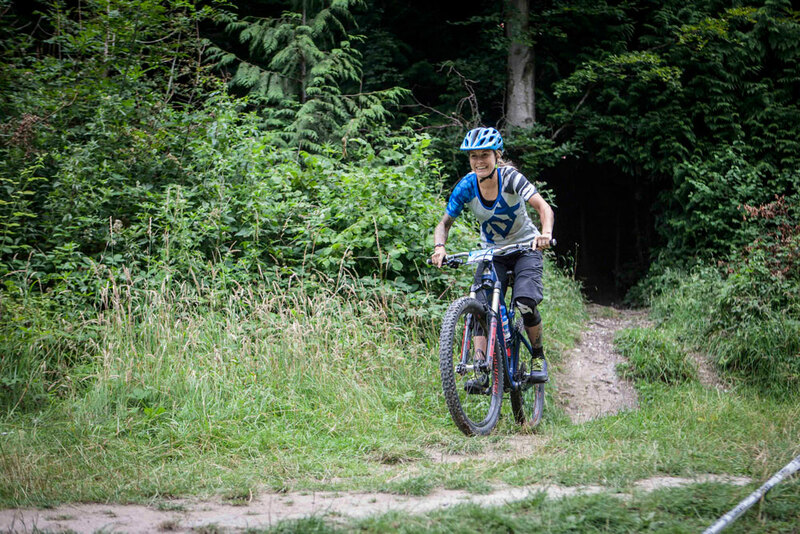 The race took part in a private section of woodland near the official mountain bike trails at Queen Elizabeth Park. I wasn’t sure what to expect but when I saw everyone wearing open face helmets I chucked my Met Parachute back in the car and followed suit. It turned out to be a wise move as it was searingly hot and the event required plenty of flat out pedaling and a stinker of a climb that that had me sweating buckets. The race tracks themselves were more Singletrack or even Cross Country in places than they were ‘Gravity’ so a high degree of fitness was a prerequisite for doing well. But then it is in Gravity Enduro too, isn’t it? I remember being astonished at how tiring riding down a hill could be the first time I raced… Prior to that I’d just assumed it would be the uphill transition stages that would wear me out! The format allowed for practice in the morning so I pedaled off to try out the tracks. All four started in the same place in the woods at the top of the aforementioned climb! Dripping with sweat, I checked out Tracks 1 and 2, both of which required a fair bit of pedaling though Track 2 also had a fun, steeper rooty section through the trees. I missed out on practicing Track 3 as I didn’t have enough time, something that would come to haunt me later. The tracks were to be ridden in order with one chance to set a fast time and at the end your times from all four tracks would be added together for your final result. I had no idea who any of the other women were, whether they were fast, whether I was fast or how I’d do so I was interested to see how I’d fare if I put in good runs on all tracks. 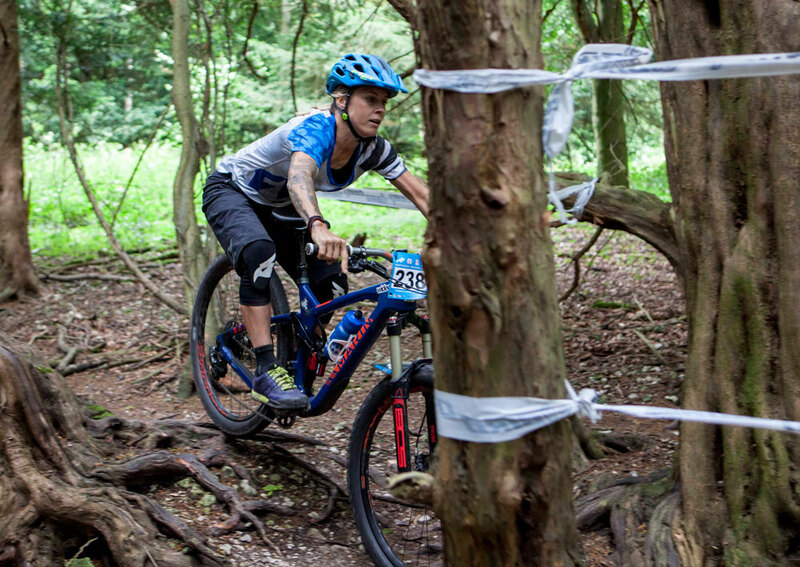 Blasting off down Track 1 I had a mega smile on my face – mountain bike races are SO fun! Unfortunately, I caught the rider in front of me rather quickly and was unable to get around for quite a long time, which I found really quite disheartening as it was only my first run and I felt that would surely spoil my chances in the race – not matter how fast I went on the other tracks I’d never be able to make the time up. Once round her I gave it some beans and finished the stage as quickly as I could, riding very erratically as a result. Whenever I try hard I mess things up! 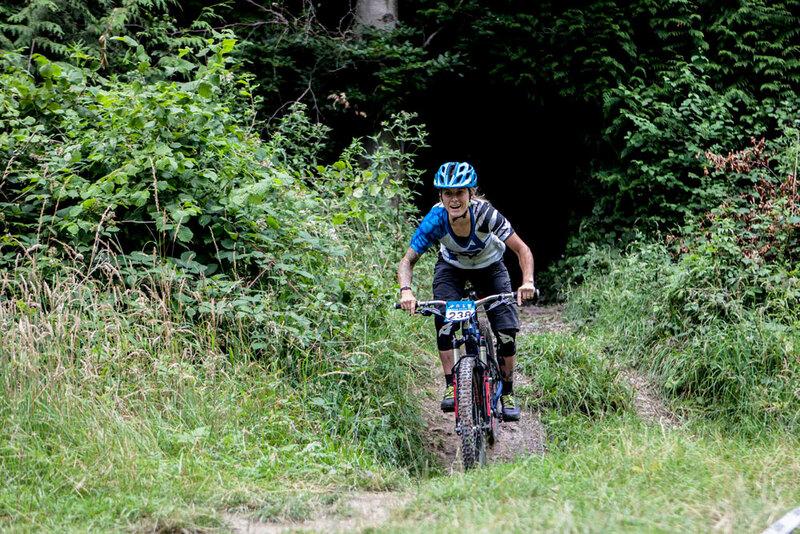 Riding back up to the top of the stages, I got chatting to some of the other female racers, which for me, is one of the best things about mountain bike races as I don’t often get to ride with other women or chat about bikes with them. Adel and Francie both turned out to be super nice but sadly live bloody miles away from me, so I doubt we’ll be going riding together again any time soon, which is a shame. I guess I’ll have to sign up for a few more races! Up at the top, we decided to switch the order in which we started to try and avoid any faster riders catching slower ones, but we didn’t get it quite right and unfortunately I caught a rider in front of me again on Track 2, and just as we were hitting the steepest most technical section. Luckily for me, she was super on the ball and nipped to the left of the trails so I was able to squeeze past, just having to back off and slow down for a while so we could both continue safely. Track 3 turned out to be wildly different from any of the other stages and I found it pretty tough, not least as I was riding it blind. It was pretty flat, with tight, flat corners strewn with large flinty chunks of rock so really hard to find any flow and I felt like I was riding it particularly badly, just going hell for leather with no style or technique and making a real mess of it. In the end, I crashed not once but twice, the second time bending my pedal pretty badly and tearing my lovely Fox shorts. I really need to learn how to calm the hell down when I race and how to not ride like an idiot. The final Track was a fast, hardpacked, fairly flat trail through the trees that I found a lot of fun as you could really get some speed up if you got it right, and I finally found some flow as I bombed my way to the end. A short, flat out sprint near the finish left me entirely breathless and doubled over as I gave it everything to claw back a few seconds. In the end, it wasn’t quite enough – despite finishing third on every Stage except Stage 3, my mistakes on tricky Stage 3 (the one I’d skipped in practice) meant that I finished just shy of the podium in 4th place. Well done to Traharn Childley on her well deserved 1st, Francie Arthur in 2nd and Natasha Litherland in 3rd.